BOONDI are crispy fried tiny gram flour balls you can prepare at home or purchase from grocery shops. Curd (yogurt or dahi) – 1 cup. Salted boondi(drop-size gram flour balls) – ½ cup. Chaat masala – ½ teaspoon. Jeera powder(roasted cumin powder)- ½ tsp. Red chili powder(lal mirch powder)- ¼ tsp. Coriander leaves chopped -1 tbsp. Salt to taste or black salt. Start with adding boondi in warm water and let them soaked for 5 to 6 minutes. After 10 minutes gently squeeze the boondi in your palms to drain excess water. In a mixing bowl whisk the curd properly. Next, one by one add all the ingredients like salt, red chili powder, cumin powder, black pepper powder, chaat masala and chopped coriander leaves or mint leaves. Again whisk the curd so all ingredients mix well. you can add water if consistency is thick. Add squeeze boondi at last and mix gently . Your boondi raita is ready to serve. 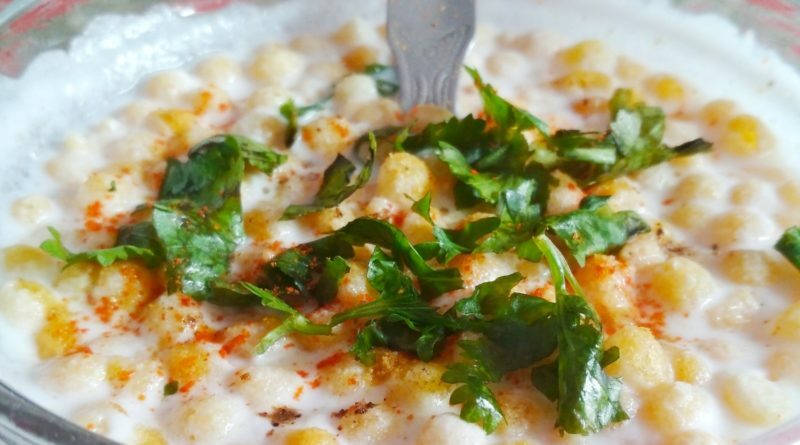 You can garnish boondi raita with more chopped coriander leaves, spices, and dry boondi. THERE ARE TWO METHODS TO PREPARE BOONDI RAYTA. IN FIRST METHOD YOU DIRECTLY ADD THE CRISPY BOONDI IN THE SPICEY WHISKED YOGURT, THIS WILL MAKE RAYATA SLIGHTLY CRISPY. IN SECOND METHOD YOU USED WATER SOAKED AND SQUEEZED BOONDI TO ADD INTO WHISKED YOGURT. THIS STEP REMOVE EXTRA OIL AND OIL SMELL FROM BOONDI. YOU CAN ADD WATER FOR RIGHT CONSISTENCY.